10 x 10 booth Pop up Displays are our most popular solutions for exhibitors looking to grow their brand. Our pop up displays are lightweight, portable and easy to assemble. They work well for small- or medium-sized trade shows or conventions where space might be tight but you want to attract attention. Trade show pop up floor displays allow for a great variety of accessories, such as monitor mounts, back lights, shelves and more. Look at our gallery of custom pop up exhibit displays for unique versions of this customer favorite! 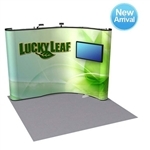 Remember, ExhibitDEAL offers graphics services that help your pop-up trade show display look its best.